Note: Product supplied is used as a proxy for consumption. In its recently released Annual Energy Outlook 2015 (AEO2015) Reference case, EIA expects U.S. crude oil production to rise through 2020 as oil prices recover from their steep decline, reducing net petroleum (crude oil and petroleum products) imports. AEO 2015 explores the effects of domestic crude oil production under various assumptions about world oil prices and domestic resource availability. In all AEO2015 scenarios, the United States remains a net importer of crude oil (despite increased domestic production) and a net exporter of petroleum products. As always with EIA base-case outlooks, AEO2015 assumes no changes in current laws and regulations. Thus, all cases in the AEO2015 assume that current restrictions on U.S. crude oil exports remain in place. Increasing levels of domestic crude oil production through 2020 have two effects: lower crude oil imports and higher throughput at U.S. refineries. Higher refinery throughput increases production and net exports of refined petroleum products like motor gasoline and diesel fuel. Together, lower crude oil imports and higher product exports reduce net imports of petroleum and other liquids, which in 2013 provided 33% of total U.S. consumption (product supplied). In the AEO2015 Reference case, this percentage falls to 14% in 2020, when domestic crude oil production reaches 10.6 million barrels per day. Domestic crude oil production then begins to decline, and the net import share of product supplied increases to 17% by 2040. 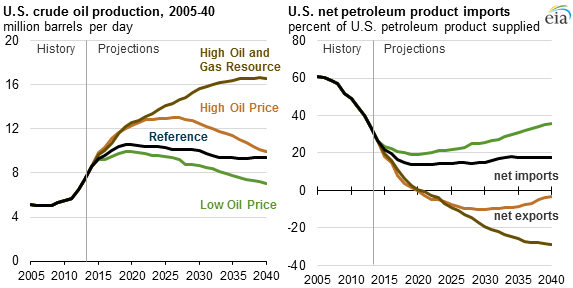 The United States also remains a net petroleum importer through 2040 in the Low Oil Price case. Low world oil and petroleum product prices result in an increase in domestic petroleum product consumption, which leads to significantly lower net petroleum product exports than in the Reference case. 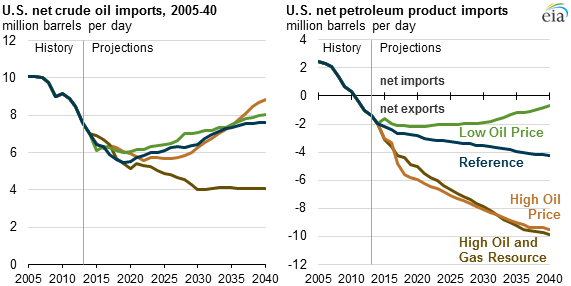 In two other cases, the United States becomes a net petroleum exporter after 2020, as net petroleum product exports surpass net crude oil imports. In the High Oil and Gas Resource case, increased domestic crude oil production growth is driven by production from tight oil formations. This higher production is a result of more optimistic production assumptions compared with the Reference case, such as higher estimated ultimate recovery (EUR), more significant technology improvements, closer well spacing, and development of new tight oil formations or additional layers within known tight oil formations. With more domestic crude oil supply, the High Oil and Gas Resource case has both the greatest decrease in net crude oil imports and the greatest increase in net petroleum product exports through 2040 of all cases in the AEO2015 analysis. In the High Oil Price case, higher world oil prices spur domestic crude oil production and reduce domestic petroleum product consumption, leading to a significant increase in net petroleum product exports through 2040. However, because the High Oil Price case contains the same resource assumptions as the Reference case, drilling moves into less-productive areas, resulting in a decrease in domestic crude oil production in the later years of the projection. However, high oil prices continue to hold domestic use of petroleum products below the Reference case level, keeping the United States a net petroleum exporter through 2040.